In the inaugural exhibition of Loo, Slow’s gallery within a bathroom, Paul Hopkin has his walls turned on his own work. Recently asked by a stranger to rent out Slow’s exhibition space in Pilsen, Hopkin was inspired to calculate how much of his building (in which he also lives) was dedicated to art space. Hopkin’s calculations led to a measurement of cost per square foot, and the silent partner of Slow, Jeffrey Grauel, immediately asked to lease the bathroom for one year—the decided lease at $19.42 a month. 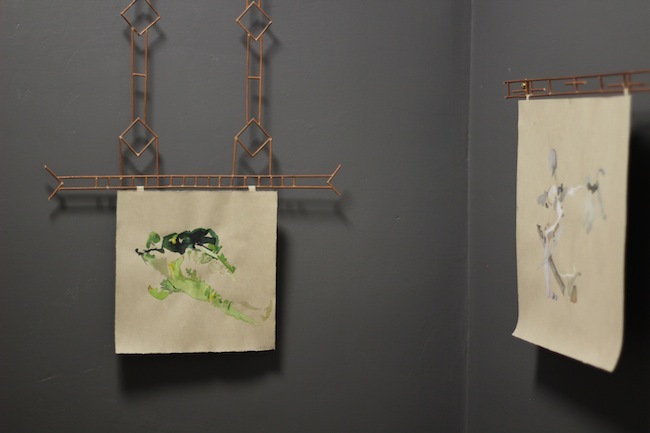 Because this is not technically Hopkin’s space, Grauel invited him to display his work for the first exhibition, highlighting the irony of Loo being a competitive gallery held within Slow’s walls, a space where the partners’ roles have been reversed. For “Special Gentlemen’s Time with Paul Hopkin,” delicate salad paintings line the bathroom walls attached to handmade displays, a delicacy that highlights the temporality of the exhibition’s nature. The paintings are just as light as their subject matter, minimal brush strokes that are engaging to the eye, even if they fail to be to the stomach. 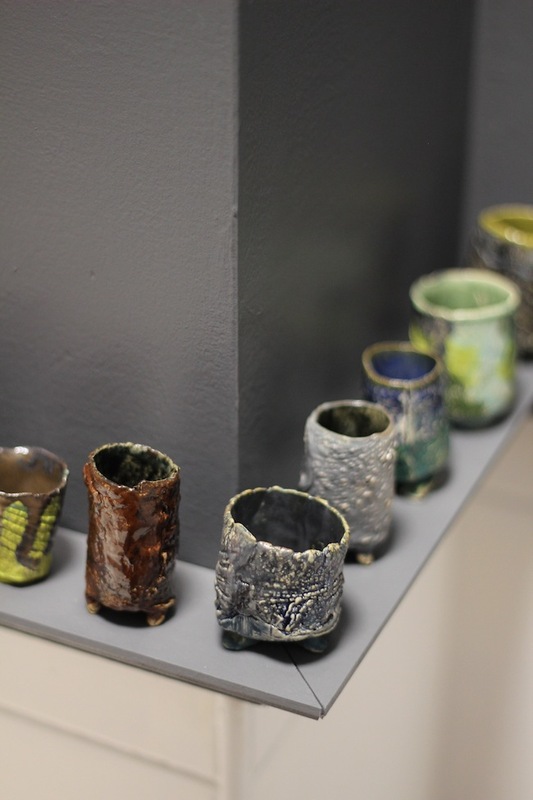 The show also consists of several small ceramic glasses, many of which match the cool blue, gray and green tones found in the paintings. Each cup is formed with the intention of holding makgeolli, a Korean rice wine that Hopkin brewed and served within the cups at the opening. A few sculptural objects are also embedded in the bathroom and exhibition, a crouton tucked in a matchbox by the door (“Muse,” 2014), and a sparse salad propped on the back of the toilet on a pale pink plate (“Remove Before Entering,” 2014). Each piece is crafted from actual food, thus adding a jab at the complicated line between art and food. Through July 26 at Loo, 2153 West 21st.